Obviously, you’re not going to cut this from your budget entirely because you need to eat. However, while you want to be responsible with your spending, you shouldn’t cut your food budget to the bare minimum and buy unhealthy food. Eating a balanced diet of nutritious food will help keep you healthy and provide energy. You may be healthy right now, but you never know what may happen in the future. Always leave room in your budget for money to go towards doctor visits, prescriptions, etc. If you don’t use the money at the end of the month, roll it over into a savings account that is only used for medical expenses. It's important that you pay yourself first every time you receive a paycheck and save as much money as you can. What's going to help build up your savings is making consistent payments, no matter the amount you are able to save each month. This means that it is important to include savings within your budget so you can track where all of your money is going. 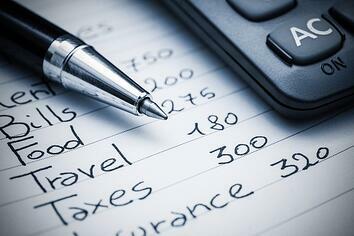 To help maximize your savings, choose the savings account that best aligns with your goals. While it’s important to save money, cutting all the fun from your budget is never a great idea. This includes going out to eat, seeing a movie, hanging out with friends, gifts, etc. Completely cutting out this part of your budget could lead to overspending and frustration with your budget as a whole.